Product #20627 | SKU IP-ILINE-IOS-IN | 0.0 (no ratings yet) Thanks for your rating! 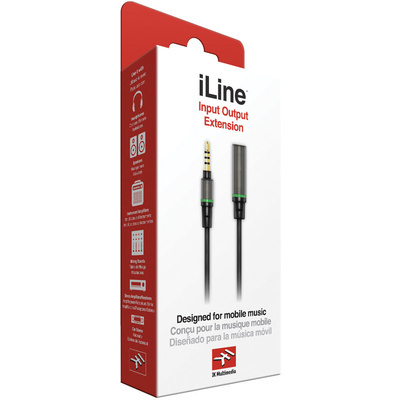 The 60 cm Input Output Extension 1/8" Male TRRS to 1/8" Female TRRS Cable from IK Multimedia can be used as an extension cable for connecting wired accessories, such as headsets or IK Multimedia's iRig, iRig MIC, or iRig MIC Cast to your iOS device. It has 24K gold-plated connectors and shielding to provide protection against EMI.